The Storm Fighter hi viz bomber jacket provides great function and visibility on the jobsite. Made from a polyurethane coated 300D Oxford fabric. Includes polyester quilted insulation, chest cell phone pocket, raised collar with detachable hood, elastic storm cuffs, and waist, and 4 inch 2 tone tape for ultimate visibility during the day or night. Meets CSA Z96-09 Class 2, Level 2 requirements. Meets Class 3 when combined with the Storm Fighter hi-viz bib pants. This Hydro Parka features 12 oz. 100% cotton Tough Duck. Lining is a quilted 8oz. Polyester insulation and laydown corduroy collar. Removable and adjustable hard hat hood with knit storm cuffs. It also features 4 large scoop pockets and a drawstring waist. It also has an inside pocket and cell pocket. Available in Brown or Black. 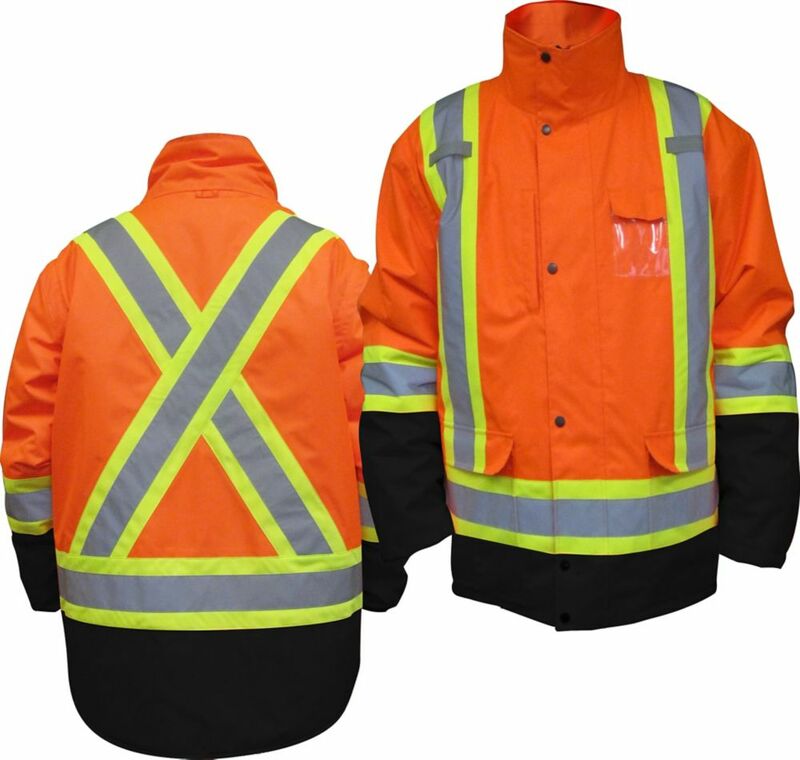 HIGH Viz Parka 5 In 1 Orange Large The 5-IN-1 interchangeable Storm Fighter jacket with removable inner jacket allows you to use both the shell and inner shell with insulated liner during any season. Both Outer and Inner shell are made from 300D Oxford 100% polyester with a polyurethane coating. Both layers include 4 inch two tone tape that meet CSA Z96-09 Class 2, Level 2 requirements and meet the Class 3 configuration when worn with the Storm Fighter Hi-Viz Bib Pants. Additional features include mesh lining, multiple pockets, chest pocket, ID window, Kidney warmer back, side zippers for quick access to bib pant pockets, adjustable elastic wrist, heavy duty zippers, and a roll away adjustable hood. Inner jacket also features removable arms and a reversible black shell.